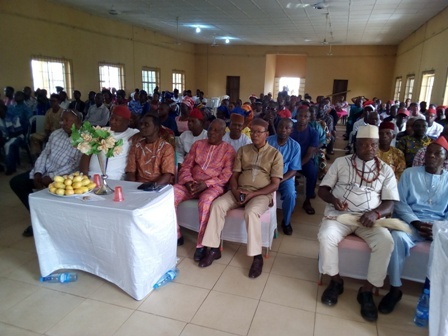 Ethnic and Local Government elected officers of Host Communities of Nigeria (Producing Oil and Gas) were on Friday, December 7, 2018 inaugurated at the Ika National Hall, Agbor, Delta State. The Chairman of Ika Ethnic Nationality of HOSTCOM, Comr. John-Hilary I. Ogwu, in his address, welcomed all present to the occasion and expressed enthusiasm over the day’s event which he described as unique especially for the fact that Ika ethnic HOSTCOM has despite the huddles and obstacles, been able to “emerge from the wrangling crises more united, stronger and ready to join forces with other ethnic nationalities in her quest to access our God given commonwealth for the good of all,” he said. He however pointed out that there are some challenges which Ika Ethnic HOSTCOM is faced with. These according to him include; a logistic vehicle for the ethnic office, a befitting ethnic office and office equipments such as computers, photocopiers, laptops, etc. These, he said will help to facilitate office automation and good delivery of HOSTCOM’s aims and objectives for the good of all. Narrating the ordeals of Host Companies since the inception of oil drilling in Nigeria, the Chairman of the occasion, the Chairman of the occasion, Chief Dr. Emmanuel U. Tibi, the Ojenebo of Agbor Kingdom and former Provost of College of Education, Agbor, said, “I do not know whether the benefits we have derived from the availability of oil in our communities can equal the pains we go through in the course of oil being processed in our communities. The Ethnic Secretary, HOSTCOM, Comr. Collins Ozuor, expressed joy over his inauguration and pledged to carry out his duties effectively with commitment and dedication. 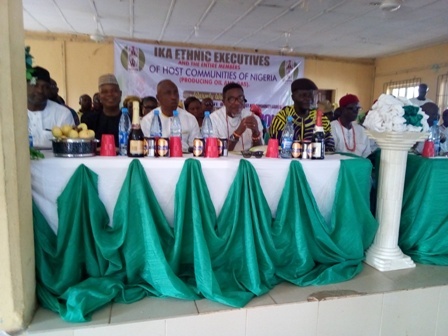 While thanking the State Executives for their magnanimity to Ika Ethnic HOSTCOM so far, the Ethnic Chairman, Comr. Ogwuh said like Oliver Twist, he is asking for more. He also extended his gratitude to the Royal Fathers and all their representatives, Chiefs and President Generals of various communities, other dignitaries and all who honoured the invitation to grace the occasion.